This is an excellent book about both the history and philosophy of art. But please don't take that to mean that Patrick Howe has produced a dry, academic tome full of the usual snotty nonsense about art. Far from it. Instead, this refreshing book opens the reader's eyes to what art is really all about, and how the expression of visual art integrates with what the author describes as the 'infinite creative force'. Despite being overtly spiritual in content, the book is surprisingly pragmatic, particularly from the viewpoint of a practising artist. The focus of the book's central thesis is spiritual awakening through art. Patrick Howe explores the relationship between the inner spiritual dimension and creativity. He draws parallels between the creation of art and the way Zen Buddhism emphasises personal transcendent experience. So, we are not looking at religious art as it is traditionally understood, but rather how transcendent spirit finds its way through the artist to the canvas. In that regard, Howe argues, pretty much all art represents the work of the infinite creative force (long-hand for God) in this One Art Movement. Howe defines three ages of art down the ages. Prior to the establishment of civilisation, there was Innocent Art, as portrayed in deep caves and through rock art. Violence and suppression of others was absent from this art, which may instead have been used as part of initiatory Shamanic practices. All well and good, until the "Age of Madness" began around 4000BCE. After this point, the art of the great civilisations focussed upon what the powerful figures in those societies wanted - personal aggrandizement, political and religious propaganda, depictions of war and the suppression of people. Howe's book reminds me of John Berger's classic "Ways of Seeing" when describing the motivating factors behind the production of art in historical times. It flows with the same simple truths which aren't always as obvious as they should be. Around the middle of the 19th Century, artists began to create art for an entirely different set of reasons, and the age of the Awakened Artist proceeded apace. This modern era of art saw an explosion of ideas in art, as artists tried to make sense of the world around them through their work. As time passed, Impressionism led to various schools of art - which Howe covers magnificently in concise, wisdom-filled writing - and eventually culminated at a point where all the possible ideas art could explore had been exhausted. That occurred, perplexingly, around the 1970s. Who'd have thought? From that point onwards we find ourselves in the period loosely defined as post-Modern (although no doubt, with hindsight, future (post-post-Modern?) generations will have a more endearing definition at hand). Having himself attended art college, and worked in commercial, creative environments, Patrick Howe knows a lot about art and the creation of art. He works as a freelance artist, running a gallery on the American West Coast, and also teaches art. He draws experience and knowledge from many angles, and this provides tremendous balance and wisdom to his writing. He also provides plenty of great advice for artists of all levels, and I certainly learned a lot from the book. In a book so full of interesting ideas and arguments, it's inevitable that I took issue with some of them. That said, there are so few of these discrepancies between us that I felt that the author is something of a kindred spirit. But where I think he may have it wrong is the idealistic picture of life he paints pre-civilisation. Although the hunter/gatherer lifestyle may indeed have had many advantages over the 'Madness' of civilisation which burst forth in Mesopotamia and Egypt 5-6 millennia ago, I hardly imagine it was a golden age of innocence. As the author himself noted, Homo Sapiens have been in the current evolutionary state for tens of thousands of years. It's hard to imagine that Ice Age folk were somehow gentle pacifists interested in transcendental mysticism. But, who knows? Without a time machine, no one can really hope to truly understand their way of life, or the messages they conveyed in their art. His argument in this regard is further complicated by remarks he makes about how people would soon lose their moral compasses if contemporary laws were to be revoked (p61). Logically, he twists himself in knots, as the Innocent folk of pre-civilised times were presumably acting without authoritative laws in place, yet were capable of a moral existence where no suppression or violence was portrayed in their art. Yet, take laws away in 21st Century USA and sit back to watch the anarchy and true feral nature of folk emerge? I don't think so. Surely if the 'infinite creative force' works through us creatively to awaken us, then the self-same force also provides something of an innate moral compass? Laws simply formalise boundaries across a familiar landscape of moral relativity. Even if across the Ages the book may drift wide of the mark, when heading across continents it finds more solid ground. Howe does a marvellous job of demonstrating the encapsulation of the Tao within Chinese and Japanese art. The emphasis on elegance, simplicity and emptiness within the moment shows the artist's personal preferences, which loosely affiliate with his expressed joy at the work of the Impressionists (particularly Monet) and the likes of the Dutch Master Vermeer. I totally get this, as do I understand his descriptions of how artists see the world, and the play of the spirit within it. You would not hear anything of this in an academic text about art, yet it gets to the core of what visual art is surely all about. This book has been written from the perspective of an artist, after all. It moves beyond mere concepts, towards wisdom and enlightenment. Post World War II, the focus of Howe's discussions turn to art in the States, as if art itself left old Europe and fled the Nazis to America. Perhaps there is an element of truth to this - the kind of Saatchified post-Modern art famous these days in Britain does nothing for me, to be honest, and his discussions of American work opened some new areas of exploration for this Brit. It is a shame that copyright laws prevent the reasonable publication of images of modern works into a book like this, although it is of course little bother to find artwork across the Internet. Overall, this was an insightful and gently inspiring book, thought-provoking for artists and truth-seekers the world over. 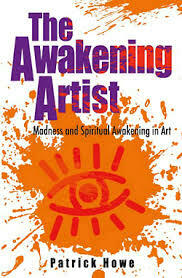 Subtitled "Madness and Spiritual Awakening in Art"